Perry Aire Plumbing provides and installs many different styles and colors of bidets, from many different manufacturers, including many new ultra water-conserving fixtures. This ensures that you have a large bidet selection to thoroughly choose from. In addition to new installs, our plumbers have the expertise and experience to identify and locate parts for almost any bidet, so we can get your bidet upgraded and in working order as quickly as possible! Call Perry Aire Plumbing at 703-521-2228 for bidet installation and repair services in Arlington Virginia, Washington DC and Maryland! 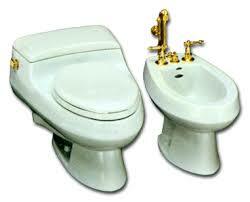 Why should you call Perry Aire Plumbing for bidet installation? VIRGINIA: Aldie, Alexandria, Annandale, Arlington, Ashburn, Burke, Centreville, Chantilly, Clifton, Crystal City, Dale City, Dulles, Fairfax, Fairfax Station, Fair Oaks, Falls Church, Fort Belvoir, Fredericksburg, Great Falls, Herndon, Leesburg, Lincoln, Lorton, Manassas, McLean, Oakton, Prince William, Purcellville, Reston, Spotsylvania, Springfield, Stafford, Sterling, Tysons Corner, Vienna, Woodbridge.